When we got married, my maid of honor concluded her toast with, "Now let's raise our glass and cheers to love laughter and happily ever after." While I thought our life would surely be that of a fairy tale, I was wrong. In our first few years of marriage; my husband survived a horrific brown recluse spider bite, my father was tragically killed, and devastatingly we received the news of infertility. Correct me if I'm wrong - but - I believe the jury is still out on when one technically becomes paper pregnant. Some say, that it's once your home study is complete. Others say that it's as soon as you are chosen by an expectant couple. I've found a few who agree with my belief - that it's as soon as you touch your first Adoption-Related paper. Waiting to get matched as a hopeful adoptive couple can be so nerve-wracking. You essentially are waiting for an expecting mother to look through your profile and say, "Hey, they look like they would be great parents to my unborn child." Every moment that passes by, you are second guessing your word choice in your bio and picture choice in the photo albums. I could write a Novel regarding all of the emotions & realities that accompany taking the first steps in the Adoption Process (and I will, don't you worry) - but I wanted to do something fun after my last more serious post. We've all seen the meme's that say something to the effect of, "Sometimes I workout everyday and sometimes I eat an entire large pizza. It's called balance." Those always get me, and I feel they really apply to life in a waiting room. You have to keep a positive perspective and maintain a balance because you're in it for the long haul, and at the end of this road is your child. I promise that you will breathe the largest breath of relief you've ever felt, when you are finally hugging your son or daughter. It's indescribable. I want to say, I completely respect the grief and heartbreak that infertility can bring, and I'm aware that some don't see an empty nursery as something to celebrate. I always saw it as a sign of hope and sort of used it as my vision board. I also know that some opt to stay off social media, because babies are everywhere, aren't they? #babyboom. I've been to the point where I'm even seeing baby faces in my soup. Ugh. Allow yourself some time to fully grieve & when you are ready, do something fun to celebrate your paper pregnancy. We started our home study right away, I made every checkmark such a fun process. And there were like 100 so, it kept me busy! Among the bajillion hoops we had to jump through - getting 'CPR Certified' was one of them. I was able to make that super fun and eventful with a cheese platter and a little wine during our in-home class (am i aloud to say that?). 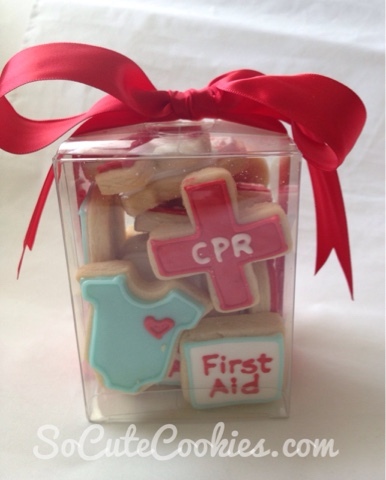 I invited our moms & had CPR cookies made that said "I Love Grandma" (I know, pretty cutesy right?) 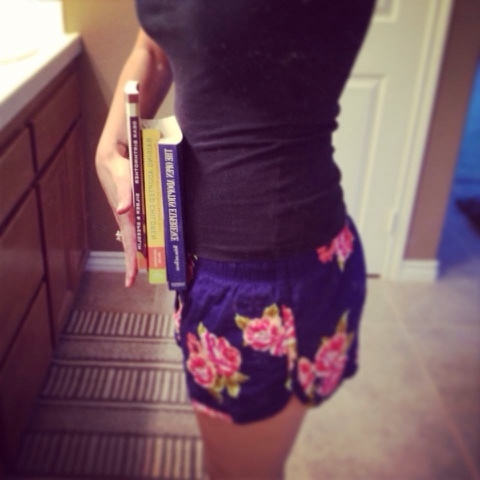 In lieu of weekly belly progression photos, every time I finished one of the required reading books I would hold it up on my belly & take that photo in the mirror. It was technically my pregnancy progression.. Hey! It made me feel better on those darker days, ok? (Sometimes I pose with books - Balance.) One of my great super-mom friends took me to go register at Babies'R'Us and we began planning my Stock the Nursery Shower. Mind you, this was all only like 2 months after our consultation with our attorney & we started telling friends and family our plans to adopt. Another friend suggested we do "we're adopting" pictures. Of course with my love for photo-ops - I was texting our incredible wedding photographer within minutes. I found a few pictures on Pinterest, which is where I discovered the term waiting for you. Knowing I had all of these little milestone moments to enjoy truly aided in keeping my spirits on the up and up. I must admit - on photoshoot day I felt a little silly taking these pics, and my husband was such a sport about it. (Know that bribery did indeed take place.) As weird as it felt, I had to remind myself that I was allowed and supposed to be excited about this. Looking back, I'm so glad we did these, and I can't wait to show my daughter just how excited we were for her to arrive in our lives. I actually show her all the time, but she's two - all she sees is the big balloon. Now, WHEN to share the fact that you are paper pregnant?? Some people share it right away - matter of fact - we were encouraged to put it out there in all forums. A lot of people meet their child's birthparents by word of mouth, it's not solely through Agencies or Attorneys. 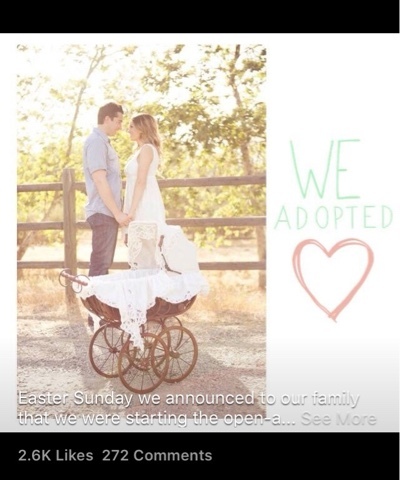 In this day and age Facebook & Instsgram can aide in Adoption connections. Saying, "We're Adopting!" will also come with lots and lots of questions/comments.. We determined that we weren't equipped to deal with said questions should we experience a failed placement. My husband and I came to an agreement that we would not announce our "paper pregnancy" publicly until we were chosen by an expectant couple. After we received the call and met our Daughter's Birthparents, we decided to enjoy the special time we had with them in secrecy. Once our daughter was legally in our custody, we announced our adoption. We've honestly never had a happier announcement or one that was so worth the wait.